This article is about the Transformers character. For Dungeons and Dragons monster, see Grimlock (Dungeons & Dragons). Grimlock is the name of several fictional robot characters in the Transformers robot franchise. He is usually portrayed as the immensely strong, power-mongering leader of the Dinobots, a small subfaction of Autobots that transform into dinosaurs. In 2007, USA Today polled people as to which Transformer they want to appear in the second installment in the Transformers film series; Grimlock came in tied for second with Devastator. Grimlock is the leader of the Dinobots, as well as the most fearsome and powerful member. Grimlock can be cold, merciless and contemptuous of those he considers beneath him, such as human beings, and at times, even Autobot leader Optimus Prime himself, who Grimlock would gladly supplant as Autobot leader if he were able to, giving him a superiority complex as indicated by his Generation 1 tech specs. Nevertheless, he is a valiant warrior whose actions command respect from all who are witness to them, both friend and foe. One of his most distinguishing features is his famous speech impediment, which leads him to shorten sentences and refer to himself constantly as "Me Grimlock", never "I" (e.g. "Me Grimlock no bozo! Me KING!") - the reason for this varies from depiction to depiction, with some making it the result of true mental limitations, and others vocal processor damage or a ruse Grimlock perpetrates to allow others to think of him as less intelligent than he actually is. However he is still an Autobot and is willing to protect the Earth as much as the Autobots, and does also show a begrudging respect for Optimus Prime, however he was more accepting for Rodimus as leader when he became a Prime. Grimlock is among the strongest of the Transformers, possibly an equal to, or even superior to Optimus Prime and Megatron in certain continuities (he was shown to be stronger than Megatron in the G1 cartoon, but in the Marvel comics, Megatron was able to defeat Grimlock and the rest of the Dinobots in their initial encounter). In Tyrannosaurus rex mode, his powerful jaws can snap virtually anything that comes between them - from steel cables to a Decepticon limb. He also can breathe fire and shoot an energy ray from his mouth. In robot mode, Grimlock wields an energon sword, whose blade is sheathed in crackling energon and can slice a 2-foot-thick (0.61 m) concrete wall in one slash. He also uses a double-barreled, self-propelled rocket launcher. He is almost invulnerable in his Tyrannosaurus Rex mode as shown with his battle with Megatron due to Megatron's primary weapon, his arm-mounted fusion cannon having little or no effect on Grimlock. Grimlock is the only Dinobot whose name doesn't begin with an S.
A Grimlock toy on display in the Natural History Museum, London. One of the original Grimlock toys is on display in the Natural History Museum, London. The original character profiles (and the tech specs derived from them) written by Bob Budiansky and Dan Bobro indicate that Grimlock and the Dinobots were intended to come from Cybertron to Earth like the vast majority of other Transformers. However, the cartoon would diverge wildly from this when it introduced the reptilian robots. Grimlock is voiced by Gregg Berger. The discovery of fossilized dinosaur bones in a cavern in their volcano base set the Earthbound Autobots on the track to creating the Dinobots. Intrigued by the creatures, and with additional knowledge supplied by Spike Witwicky, Wheeljack and Ratchet created three "Dinobots" – Grimlock, Slag and Sludge. It has not been explained why he or the other Dinobots were able to be fitted with personalities which can only be found on Cybertron from Vector Sigma. Their brains are simple, yet still it is the personalities that make them sentient. It is evident that addition of personalities or "sparks" and its origin was after the fact, and was hoped that this inconsistency would be overlooked. Their design specs proved to be too accurate to the creatures they were modeled on, as their primitive brains went out of control, and Grimlock almost destroyed Teletraan I, before the trio was stopped. Optimus Prime deemed them too dangerous to use again, and had them sealed back up in the cavern, but when the majority of the Autobot force was captured by the Decepticons, Wheeljack freed them to go to their rescue. Equipped with new devices that enhanced their brainpower to functional, yet still impaired, levels (resulting in slow thought processes and simple, clipped speech), the three Dinobots successfully rescued their Autobot comrades, and Optimus Prime admitted his error. In his private thoughts, however, Grimlock considered Optimus Prime too weak to lead, seeking the position for himself. When Soundwave read his mind and learned of this animosity, Megatron was able to trick Grimlock and the Dinobots into switching sides, attacking and capturing Optimus Prime. To stop the turncoat Dinobots, two new ones were created: Snarl and Swoop. Ultimately, it was when Optimus Prime threw himself into harm's way to save Grimlock from an explosion that he accepted his mistake and rejoined the Autobots. In a rare display of modesty and humility, Grimlock emotionally apologized to Prime, admitted his jealousy of the leader, and accepted fault for the battle. The two subsequently patched up their differences. Although content for the moment to remain a soldier, rather than a leader, Grimlock still had trouble accepting orders, only agreeing to help stem the tide of natural disasters ravaging Earth due to Cybertron being pulled into its orbit when he realized he would die if he did not. Grimlock and the Dinobots were semi-regularly called into action when the Autobots were faced with challenges that required extra strength, such as the Sub-Atlantican invasion of Washington, D.C., or the Decepticons' control of the TORQ III supercomputer; with every piece of help he and his troops gave, Grimlock was never slow to add a scathing remark about the inabilities of the Autobots. That said, he was not unwilling to admit the failings of his own troops, either, and willingly took them to the time-displaced "Dinobot Island", where they trained in the wilderness and helped stop a Decepticon raid on the prehistoric paradise. The final straw for Grimlock came when he and the Dinobots were injured in a Decepticon trap at an airfield. Enraged, Grimlock refused to take orders from Optimus Prime anymore, and he and the other Dinobots left. When the Autobots began to suffer from Cybertonium deficiency, Spike Witwicky and his girlfriend Carly attempted to persuade the Dinobots - who continued to function perfectly, as they had been built on Earth without Cybertonium - to steal some of the mineral from a Decepticon shipment coming in from Cybertron. Grimlock instead opted to lead the Dinobots to Cybertron itself, where they (except Swoop) were captured by Shockwave and put to work in the Cybertonium mines, until Swoop, Spike and Carly rescued them. Brought back to Earth, the Dinobots agreed to follow Prime's order again - until such time as Grimlock did not feel like it. By the Earth year 2005, it seemed apparent that Grimlock had undergone some degree of a personality change, becoming more childish and petulant, rather than brutish and stubborn. He and the Dinobots accompanied Optimus Prime on the latter's rescue mission to Autobot City, and fought Devastator. Subsequently, the Dinobots joined Hot Rod and his companions in traveling back to Cybertron to face the evil Unicron. Also of note, it seemed that, along with the other Dinobots, Grimlock remained in his dinosaur mode almost exclusively, rarely changing back to his robot form. Throughout 2006, he regularly participated in missions with his fellow Autobots rather than the other Dinobots, battling on the planets of Chaar, Goo, Dredd and Eurythma. In episode #78, "Madman's Paradise", Spike and Carly hosted a banquet for a visiting ambassador. Their son Daniel got bored and wandered off. Grimlock followed him, and they fell into a lost chamber where Quintessons banished their criminals to other dimensions. They slipped through to the other-dimensional realm of Menonia, and were tricked into fighting on the Red Wizard's side, only to find out that he was the Quintesson criminal, who overthrew the Golden One. Ultra Magnus, Blaster, Eject, Rewind, Ramhorn, and Steeljaw followed, and using Blaster's amplification, they help the Golden One defeat the Red Wizard. With the help of Perceptor, the Autobots and Daniel are returned to Cybertron. Grimlock helped to sniff out the "dinosaur transform static" that implicated Trypticon in the theft of world monuments. Later in the year, when Galvatron, the new Decepticon leader, had Cybertron infused with function-inverting anti-electrons, a dose of the particles gave Grimlock super-intelligence. For the first time Grimlock identified himself as "I, Grimlock". During a mission to Unicron's disembodied head, where the Autobots were outmatched by the new Decepticon Terrorcons, Grimlock used components of Unicron's head to construct the Technobots to battle them. Combined as Computron, the Technobots felt they could not match the Terrorcons, until Grimlock transferred his super-intelligence into Computron, reverting to his old self and allowing the Autobots to claim victory. Grimlock's greatest victory came when he and a large number of other Transformers with primitive animal-themed transformations were summoned to a world at the centre of the galaxy by the ex-assistant of the ancient genius, Primacron, creator of Unicron. The assistant had assembled these "Primitive" Transformers in the hope that their simple instincts could defeat Primacron's newest creation, Tornedron, but one by one they fell to him, with Grimlock apparently crushed under Trypticon. Grimlock survived, however, and followed Tornedron back to Primacron's lab. When Tornedron turned on his master, like his predecessor, Primacron's complicated plans and equations could not find a way to stop him; Grimlock, on the other hand, randomly flicked a switch which reversed Tornedron's energy polarity, undoing the damage the now dissipating Tornedron had done. Grimlock decimated Primacron's lab while dancing around over his successful saving of the universe, dubbing it the smartest thing he'd ever done. In the year 2011, the Decepticons invaded Cybertron in full force. Grimlock was deployed by Wreck-Gar to fend off the invaders. He was seen fighting alongside his fellow Dinobots as well as the Throttlebots against the invading Decepticons, however, they didn't fare too well against the Decepticon Headmasters, as they are all quickly put to sleep by Mindwipe's hypnosis attack. In the second episode, Grimlock was again in action, trying to protect Vector Sigma along with two fellow Dinobots and Jazz. After the animated series ended in the US Grimlock appeared in animated form one last time in the commercial for the Classic Pretenders. There is a notable disparity in Grimlock's speech patterns between the second and third series. In the second series he is seen to speak normally, referring to himself as "I". However, in the third series he speaks in his more normal "Me Grimlock" speech. The 21st century re-imagining of the original universe by Dreamwave Productions depicted Grimlock in a manner similar to his depiction in Marvel Comics - a powerful, cunning warrior who values strength of body and character. Through Transformers: The War Within, the company shaped a background on Cybertron for Grimlock which showed that he had participated in the planet's underground gladiatorial game in order to unleash the rage and anger he had always overflowed with. 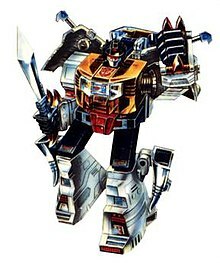 When Megatron began using the games to identify suitable soldiers for his burgeoning Decepticon army, Grimlock was recruited by him and initially fought on his side, befriending Starscream and perhaps the scientist, Jetfire, before defecting to the Autobots - not out of any particular fondness for them and their ideals, but rather out of sheer hatred of Megatron and his ideals. He still bears a particularly fierce grudge against Jetfire over an unspecified incident with a cerebro-shell. What is known of the remainder of his time on Cybertron, however, is that he, Slag, Sludge, Snarl, and Swoop formed a team known as the "Dynobots" (they are referred to as such in the first issue of "The Age of Wrath"). The Dynobots remained on Cybertron when Optimus Prime left on The Ark, pursued by Megatron. When Optimus Prime and Megatron's troops vanished four million years ago, they pursued the Decepticons known as the Insecticons, who had set off in search of the missing leaders. The two teams battled on prehistoric Earth, and the battle ended with both sides trapped in stasis. The eventual awakening of Prime and Megatron's forces in 1984 was followed by the Autobots' discovery and reactivation of the Dynobots, now rechristened the "Dinobots" for their new dinosaur alternate modes. Grimlock appears in "Beast Wars Shattered Glass Chapter One: Shattered Time" by Fun Publications. In this story Ultra Magnus and the Autobots aboard the Graviton battle Megatron and the Decepticons aboard the Talon. Both ships are pulled through a vortex into the past of Shattered Glass Earth. Crashing they discover that dangerous energon readings outside the ship will place them in stasis lock. The Autobots devise organic alternate modes to protect them from the energon. The Decepticons create energon-absorbing armor for protection. Grimlock takes on the alternate form of a white velociraptor (his Beast Wars toy). This team of animal-based Autobots eventually renamed themselves "Maximals" after encountering a member of that faction from an alternate universe. Grimlock and his fellow Maximals eventually joined forces with the heroic Decepticons-as opposed to their Megatron's renamed Predacons-under Galvatron. This would lead to Grimlock joining Galvatron in coming to the aid of Decepticon City on Earth when it was attacked by the Autobots in an effort to break the Decepticon war effort once and for all. Grimlock would be sent in to attack Superion, only to be overpowered after letting his guard down due to the humor-in his eyes, at least-of a Combiner made up of Micromasters. Fortunately, the Micromaster Predacons came to his aid and thwarted Superion's assault. Grimlock was also featured in the Beast Wars: Uprising storyline as a member of the Maximal-Predacon resistance movement instigated by Lio Convoy. Having transplanted his Spark into a Maximal protoform to avoid the immobility common among his fellow Autobot and Decepticon "Builders," Grimlock launches a violent campaign seeking to topple the old regime and bring Cybertron under resistance rule. However, his extreme agenda eventually leads him to steal the G-Virus, a contagion born from the essence of the fallen Galvatron with the ability to remake any Cybertronian in his image. Grimlock soon leads his team to a gladitorial event, intent on unleashing the virus on the spectators, only to have the now Micromaster Hot Rod interfere. One of Grimlock's own subordinates then destroys most of the virus, unaware that a Cybertronian has already been affected and been turned into a new Galvatron. Following this, Skywatch, a government agency who knew about Transformers, took over the site. Later, following escalating Transformer activity on Earth (as seen in The Transformers: Devastation), and losing control of their other captive Transformers Ravage and Laserbeak, Skywatch reactivated Grimlock as a response. The reawakening was sabotaged by the Machination, and Grimlock escaped. He met Scorponok, who proposed an alliance as they were both now fugitives. Grimlock refused, but lost the subsequent battle, teleporting himself to the Dinobot ship. Vowing to bring down Scorponok, he was unaware the Machination were manipulating Skywatch into reactivating the other Dinobots, with the aim of having them dispose of Grimlock (Spotlight Grimlock). Following their acquisition of the Transformers licence in 2005 IDW Publishing released a comic book series which takes place during the Beast Wars animated series, but features the toys and characters who did not appear in the show itself. The Beast Wars incarnation of Grimlock appeared, as a gigantic white Velociraptor-type dinosaur, and it was revealed that Grimlock was among those in protoform stasis on the Axalon, and like the others was launched into space in the series pilot. He fought against Predacon leader Magmatron in a one-on-one battle but lost the upper hand when Magmatron split into three separate beast forms, which attacked him simultaneously; in the long run however, he provided the necessary distraction for the Maximals to steal Magmatron's Chronal Phase armband, leading to his ultimate defeat. Grimlock has since joined Razorbeast's Maximal team. After the defeat of Magmatron's Predacons the united group of Maximals awaited rescue from Cybertron. Grimlock had a biography printed in the Beast Wars Sourcebook by IDW Publishing. Grimlock also features briefly in the comic story "Dawn of the Predacus" in which his exposure to transmatter turns him into a protoform, heralding his eventual role in Beast Wars fiction. As he is placed in a stasis pod he is looked upon by Predacon-and future Maximal-Dinobot, possibly indicating where the warrior took his future name. It soon proved that people with power, especially a lot of power, are more likely to be corrupt. Grimlock became a tyrannical ruler who led the Autobots with an iron fist. His policy towards Earth and its inhabitants were vastly different from Optimus Prime's – instead of viewing them as objects of protection, Grimlock expressed a disdain for humanity, viewing them as an inferior species unworthy of their protection. Under Grimlock's leadership, the Ark was repaired and made space-worthy again. Grimlock will be portrayed as Hal the Boomerang Bird in Angry Birds Transformers. This version is not a humanoid who can change into a tyrannosaurus, but rather is a Tyrannosaurus who can change into a motorcycle. Grimlock's toy was originally part of Takara's Diaclone Dinosaur Robo series. When Hasbro imported the toy in 1985 for the Transformers line, the blue crotch was changed to red and the Diaclone driver mini-figure was dropped. The original Grimlock changes from a robot into a robotic T. rex and comes with a red sword, a black double-barreled rifle, and a rocket launcher with three silver rockets. Grimlock was later reissued in the European/Australian-exclusive Classics series (not to be confused with the 2006 Classics line). A variety of knockoff toys of Grimlock have been produced, including those with gold chrome, large horns on the head, and those remolded to look like Mechagodzilla. Beast Wars Grimlock (himself a recolor of Beast Wars Dinobot) was remolded in silver and orange to appear more cybernetic as Thrustor for the Japanese-exclusive Beast Wars Second line. Later, for Beast Wars Neo, the toy was remolded to become Hardhead, a blue and purple Pachycephalosaurus, and this version of the figure was redecoed in yellow, black and green and released in the Beast Machines Dinobots subline as Dinotron. After being released under the Grimlock name again in 2003, the original version of the mold returned to its roots when it was redecoed into the 10th Anniversary edition figure of Beast Wars Dinobot. An unlicensed smaller reproduction of the Generation 1 figure by JustiToys, in the style of Takara's Smallest Transformers. A Walmart exclusive redeco of Beast Wars Grimlock that came packaged with a Terrorsaur redeco named both Swoop and Terranotron. While the Autobots on Earth were decimated by Cosmic Rust and restored in new "Binaltech" bodies through a joint partnership with human automotive corporations, Grimlock and the Dinobots were a part of the larger war raging in space. Unfortunately, Megatron struck at their primitive minds with telepathic alien lifeforms known as "Unleashers," which drove them to attack their fellow Autobots; with no other options, the Autobots were forced to counterattack, taking the Dinobots out of commission. Grimlock regained consciousness and vowed to do anything to return to the battle, and was consequently transported to Earth. His spark was implanted into the Autobots' newest Binaltech body, which combined all the aspects of the previous bodies. Now able to transform into a Ford Mustang GT, Grimlock immediately resented his new, non-traditional body, but came to make the best of it. He remains armed with his energo-sword, and also wields a stun laser. Grimlock was released as a 3 inch tall non-transforming toy in the Transformers: Titanium line. Mightiest among the Dinobots, Grimlock masked a surprising intelligence behind simplistic speech patterns. His contempt for the weak kept him often at odds with Optimus Prime, but his hatred for all those who exploited their strength at the expense of others kept him always firmly on the side of right. 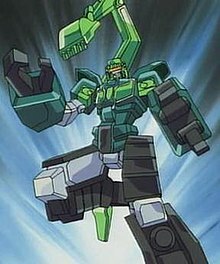 Though he could bring a huge array of weapons to any fight, he preferred to close with his enemies, wielding his Energo sword in robot mode, or simply crushing his enemies' limbs with his powerful jaw as a Tyrannosaurus. The original Grimlock returned to his original T. rex Beast mode in the Transformers Classics line, released in December 2006. He returns as leader of the Dinobots, in a toy that is a homage to his original and pretender releases, but with a totally new mold and for the first time, a flexible articulated tail. His fiction seems more in-tune with his The War Within persona, faking his impediment to trick his enemies, as well as collecting pieces of his opponents left over after battles to add to an ever-growing collection. Classics Grimlock represents modern research regarding the T. rex, with a horizontal back and tail carried high, rather than the classic sloped back and a ground-dragging tail. This toy was redecoed into BotCon exclusive Overkill (2007) and Shattered Glass Grimlock (2008). Series 2 of the Transformers Attacktix figures included a Generation 1 Grimlock figure in beast mode. Produced by Wizards of the Coast, wave 2 of their Transformers 3D Battle-Card Game included a Grimlock card. In March 2009, Takara released a Masterpiece-series Grimlock in his robotic and dinosaur form. The figure is highly articulated, comparable to the other masterpiece transformers. This figure also has eyes that can be switched between red (the original toy color) and blue (the animated series color) in both robot and T. Rex modes. It makes no sounds, but does have a light-up blaster and sword. Other accessories include an attachable brain transfer device (as seen in the episode "Grimlock's New Brain", where he transferred his newly acquired intelligence to his creation, Computron), a bowtie, an apron and a cocktail tray (used by Grimlock in "Madman's Paradise" as a waiter during an alien ambassador's meeting on Cybertron). This figure is a breath of fresh air for the Masterpiece line, in the sense that the transformation is not as complicated as the other Masterpieces, which is almost similar to that of the original G1 figure. Also available in a purple redeco as Dinosaurer/Trypticon. An unlicensed set of accessories for Masterpiece Grimlock made by iGear. This set includes a crown, a mug and small, non-transforming version of Thrust in jet mode. The Toys "R" Us U.S. exclusive release of Masterpiece Grimlock differs slightly from the Japanese version. More colors have been added on some parts of the figure. The teeth and claws on dinosaur mode are not as sharp as those on the Japanese version. Only the sword (which is molded in clear white instead of clear orange), gun and crown come as accessories. Another alternate-universe incarnation of Grimlock entered the fray in the Transformers: Energon line. Grimlock's toy – packaged with the similarly-redesigned Swoop – was a modern updating of his original figure. It still transformed into a Tyrannosaurus rex, but had one major change: Grimlock and Swoop could now combine to form a larger robot named "Mega-Dinobot". The characters' joint biography clearly draws on the Generation 1 cartoon incarnation of the original characters, presenting them as Autobots who are simple in speech and thought, but who make up for it in raw strength. Decepticons have been known to flee in fear when faced with the two Dinobots, as Swoop uses his aerial abilities to confuse and distract them, while Grimlock attacks from behind and stomps them flat before they know what hit them. Though heavily armed, the duo's preferred weaponry is their teeth and talons. It comes as no surprise that longtime Grimlock fan Simon Furman intended to feature the characters in Dreamwave's Energon comic book, but the company's closure prevented this. Grimlock appeared in the text story from Fun Publications called "Force of Habit". This story explained where he was during the events of the Cybertron story. Ultra Magnus was the commander of various Autobot ships sent to other planets in search for the Cyber Planet Keys. He also served as captain of the Iron Hope which was crewed by Bonecrusher, Grimlock, Ironhide, Knock Out, Overcast, Prowl, Quickstrike, RipTide, Skyblast, Smokescreen, Swoop, Wreckage, and the Sky Scorcher Mini-Con Team. Grimlock and Swoop were sent to stop an attack by Predacon on the ship. Producer Tom DeSanto has stated that he had an idea on how to include the Dinobots and Constructicons in a possible sequel, although director Michael Bay has confirmed that they will not be. However, the Constructicons and their combined form, Devastator, do appear in the 2009 movie. In a USA Today online fan poll, Grimlock was one of the 10 Transformers that the fans wanted in the sequel, tied for second with 16% of the votes. Later reports revealed that Grimlock and other Dinobots would be featured in the fourth film, with images surfacing of Optimus Prime riding Grimlock into battle in Hong Kong. In Transformers: Age of Extinction, Grimlock and the Dinobots are captured by Lockdown as trophies, referred to as legendary knights. After the Autobots escape with the part of the ship holding them, Optimus releases the Dinobots for backup and engages in a battle for dominance with Grimlock which Optimus wins. Submitting to Optimus, Grimlock allows Optimus to ride him into battle in Hong Kong and aids in destroying the KSI Decepticons and protecting the Seed. After Lockdown is defeated, Optimus releases Grimlock and the Dinobots to go their own way. This Grimlock is larger than previous incarnations and, like the rest of the Dinobots, he isn't referred to by name (although in The Last Knight he is named by Cade Yeager) as he cannot speak, or at least has yet to learn how. Grimlock returned in Transformers: The Last Knight. Grimlock is among the Autobots taking sanctuary at Cade Yeager's junkyard. He has taken up the personality of a dog, often eating the local police chief's car. During the TRF and Decepticon invasion of the junkyard, Grimlock attacks a fleet of TRF cars along with Slug, eating the Decepticon Dreadbot. Though he is not seen after this, Grimlock presumably joins the other Autobots in returning to Cybertron on Lockdown's ship. Mini-Grimlock, a baby Dinobot, also appears in the Last Knight, as one of the Autobots in Cade's junkyard. It gains Grimlock's fire breath, which it uses in Cade's trailer. Mini-Grimlock is seen snuggling with Izabella and around the other Autobots. The Sector 7 viral marketing web site featured several videos recording supposed evidence of Transformers on Earth. These featured cameos by Generation 1 Transformers, including scenes of Grimlock destroying a construction site, as well as scenes of Kickback and Laserbeak being video taped by people accidentally, and a security video showing bits of a robot looking a lot like Generation 1 Bumblebee transforming in a parking garage. Grimlock's Age of Extinction incarnation is a playable character in Transformers: Rise of the Dark Spark. In the game, he controls very identical to his counterpart in Transformers: Fall of Cybertron. Grimlock is one of the main playable characters in Transformers: Devastation, and the only one who does not transform into a motor vehicle. A new transforming toy aimed at younger children. A non-transforming toy of Optimus Prime riding on Grimlock. Optimus Prime is a non-poseable figure with a long sword while Grimlock features pull-back action that activates sparks in its body. A new Voyager Class mold of Grimlock. Features chomping mouth action at the push of a button in dinosaur mode. A new Leader Class mold of Grimlock. This Grimlock has a back plate that turns into a spiked shield, and a tail that turns into his dragontooth mace. A non-transforming figure of Grimlock with limited poseability. A character named Grimlock appears in Transformers: Animated, which began airing in 2007. He is similar to his animated Generation 1 incarnation in persona and form, but with his face modified with a feral look. His beast mode now looks more like how an actual Tyrannosaurus is thought to look and his roar sounds much like the T. Rex's roar from Jurassic Park. In robot mode, he wields a flaming battle sword and can breathe fire in beast mode. Grimlock is partnered with fellow Dinobots, Snarl and Swoop. He debuts in episode 6, "Blast From the Past". Grimlock acquired his name while the damaged Megatron's head was surveying the Dinobots at Prof. Isaac Sumdac's laboratory. Megatron said, "And without more substantial robotics for my own body, my prospects are grim, locked in this prison of a lab." He is also the only one of the Dinobots to talk and the first to transform into robot mode. In "Blast From the Past" the Autobots visit a dinosaur-themed amusement park where animatronic dinosaurs are on display, but Bulkhead accidentally breaks them. Professor Sumdac and Megatron rebuild the animatronic dinosaurs as technological wonders named the Dinobots, who go on a rampage under the Deception's influence until the attacks powered Sari's AllSpark key affecting Bumblebee and Ratchet's Electromagnetic blast against the Dinobots by making them conscious. Finding a way to control them, Megatron told Grimlock to attack the city by telling the Dinobots they are "fossil feeders" due to the way Earth vehicles are powered and that the Autobots are even worse. The Dinobots are lured away by the Autobots, with Prowl secretly placing them at the later named Dinobot Island in hopes that they'll live in peace. However, while expressing his rage at two birds defecating on him, Grimlock accidentally transforms to robot mode and finds his new form to his liking. In a TFA short, "Bulkhead Plays with Grimlock", Bulkhead throws a tree for no reason. Then Grimlock catches it with his mouth, and brings it back to Bulkhead. Grimlock states he loves fetch and asks to play again. Apparently this is a contradiction to "Human Error Part 2" where he criticized Snarl for willing to become a pet to Scrapper. The episode "Survival of the Fittest" marks his, as well as the rest of the Dinobots, official side change when they help defeat Meltdown, Cyrus "The Colossus" Rhodes, and Meltdown's experiments. In "Megatron Rising" Pt. 1, Optimus Prime, Prowl, and Bulkhead try to get the Dinobots to help them fight the Decepticons, but they refused saying that robots are their enemies. Upon them being told that they are robots too, Grimlock and the other two Dinobots end up fighting each other. In "The Elite Guard", Optimus Prime leads Ultra Magnus and Sentinel Prime to the downed ship on Dinobot Island when they run into Grimlock and the Dinobots. Despite Optimus' warnings, Sentinel Prime charged them and got defeated. Ultra Magnus repelled them with the lightning he summoned with his hammer. In "A Fistful of Energon", Prowl and Bulkhead are sent to the island where the Dinobots are, once again, to investigate the reports of a rampage. Soon enough, Grimlock heads right towards Prowl and Bulkhead, thinking something has made him hostile, but later discovering something is wedged between his foot, and yank it out. Later, under Blackarachnia's seduction, Grimlock returns in the episode "Black Friday" to break out Meltdown. Out of the Dinobots, Grimlock had the most love for Blackarachnia, refusing to accept that she's using him when she departs, leaving him heartbroken. In "Predacons Rising" the Dinobots are once again coerced into doing Blackarachnia's bidding, bringing them into conflict with the Autobots. In the ensuing battle, they are overwhelmed and defeated by Jetfire and Jetstorm, though Jetfire noted Grimlock seemed to have some fight left in him. During the Human Error 2-parter, Sari attempted to get the Dinobots' aid only to have a not so warm welcome. Though she managed to convince him not to attack with her techno-organic powers, Grimlock refuses to give the Autobots aid; however, he indirectly led her in looking for Snarl, whom he lost respect towards and considered a 'traitor' for befriending the marooned Scrapper. Grimlock appears among the characters in Re-Unification, the 2010 TFCon voice actor play prelude comic. Grimlock transforms into a mechanical Tyrannosaurus fairly accurate to his Animated appearance. He comes with a large, transparent orange sword with flame details that spring out when the sword is placed in his right hand and the wrist is twisted clockwise or counter-clockwise. A button on his dinosaur mode neck opens his mouth. The transformation sequence is very close to his original G1 toy, but with more details and a few minor steps added. The box packaging and instructions mention the sword also being able to connect to his mouth as a "Jet flame breath attack," though there are no actual connection points in his mouth. This feature was probably dropped during production due to issues with getting the sword to actually fit inside his mouth. A small version of Grimlock that transforms at the push of a button. First seen at San Diego Comic-Con International 2008. Also bundled in Japan as part of the "Super Collection Vol. 2" gift set with Activators Bumblebee, Bulkhead (Ironhide in Japan) and Starscream. A metallic gold repaint of the Voyager Grimlock. A redeco of the original Activators Grimlock. His paint job and design represents a volcano. The 2010 Japan version by Takara Tomy sports brighter shades of gold and red than its original counterpart, as well as a red Autobot emblem on the chest as opposed to a silver-colored one. A BotCon '08 exclusive redeco of the Classics Grimlock figure in the colors of Generation 1 Trypticon. Grimlock concept art from the DS War For Cybertron game. Grimlock is known for not following orders or trusting in Optimus Prime's ability to be an effective leader. As the leader of the Lightning Strike Coalition Force, Grimlock enjoys smashing things first and asking questions later. Due to Shockwave's experiments, Grimlock has been left with a malfunctioning voice processor and alt-mode inspired by a distant primitive world. 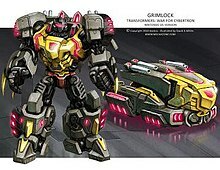 Grimlock is part of Bumblebee's new team of Autobots in Transformers: Robots in Disguise, though his personality is much different then what was seen in Fall of Cybertron and the Aligned Continuity Comics, and his character's history seems to apply that this is a different character. Coincidentally, this incarnation also sports green colors similar to the 2001's incarnation from the series also titled Transformers: Robots in Disguise. He also speaks properly unlike previous incarnations. It is later revealed by one of the show's producers that there is more than one Grimlock in this continuity. Grimlock appears in the Transformers: Prime spinoff comic series, Rage of the Dinobots, in which he and the other Dinobots remain behind on Cybertron after Optimus Prime departs. Grimlock becomes the leader of a city known as Last Spark, ruling over and protecting the citizens in a monarchial fashion. He and the other Dinobots are forced to contend with the prejudices of other Cybertronians due to their altered states, as well as Shockwave's creations, which include a group of Decepticons known as the Forged. Grimlock is one of the main characters of subject in the 2012 game Transformers: Fall of Cybertron, where he and his team are captured by Shockwave and the Insecticons and taken to a laboratory where Shockwave transforms them into the Dinobots. Grimlock becomes the first to break free following a brief encounter with the disgraced Starscream and proceeds to free three of four (Sludge having been put in stasis lock and left behind after they were captured) other members of his team, discover his Dinobot abilities, and destroy the space bridge Megatron plans to use as a route to a perpetual energy source, Earth. Grimlock is one of the characters who is set to appear in Transformers: Cyberverse. ^ Alvarez, J.E. (2001). The Unofficial Guide to Transformers 1980s Through 1990s Revised & Expanded 2nd Edition. Schiffer Publishing Ltd. p. 27. ISBN 0-7643-1364-9. ^ Pirrello, Phil; Schedeen, Jesse (June 10, 2009). "Transformers: Our Favorite Autobots". ign.com. Retrieved October 24, 2013. ^ Dinobots Strike Back. Ballantine Books. 1985. ISBN 0-345-34150-3. ^ "Transformers: BotCon 2009!". Botcon.com. Retrieved 2013-12-01. ^ "Transformers Spotlight: Grimlock Review". IGN. Archived from the original on 2012-02-27. Retrieved 2010-09-07. ^ "Transformers comics, cartoons, toys and everything else!". TFArchive. Archived from the original on 2009-07-10. Retrieved 2013-12-01. ^ "The Transformers #52: "Guess Who The Mecannibals Are Having For Dinner?"". Seibertron.com. 2013-11-26. Retrieved 2013-12-01. ^ Meesum Abidi (2008). Ground Effects. Illustrator Dylan G. TFcon. ^ "Part 1 - TFCon2008 Voice Actor Script Reading". YouTube. 2008-06-25. Retrieved 2013-12-01. ^ "MP-8 Upgrade Set - Third Party Unofficial Custom Transformers". TFW2005. Retrieved 2013-12-01. ^ "Transformers Shirts & Costumes". 80sTees. 2003-10-15. Retrieved 2013-12-01. ^ "Desanto has Idea to have the Dinobots and Constructicons in Transformers 2". Seibertron.com. 2013-11-26. Retrieved 2013-12-01. ^ "No Dinobots In 'Transformers 2: Revenge of the Fallen'—Original Film Consultant Explains Why". MTV Movies Blog. ^ Breznican, Anthony (2007-07-23). "'Transformers' fans make some noise for Soundwave". USA Today. Retrieved 2010-05-04. ^ Shirey, Paul (2013-05-21). "Exclusive (Spoilers): What classic characters are set to appear in Transformers 4? - Movie News". JoBlo.com. Archived from the original on 2013-11-09. Retrieved 2013-12-01. ^ "Transformers Movie Update: Sector Seven Video Gives Nod To Dinobots, Insecticons, Lazerbeak And Generation One Bumblebee". Jalopnik. 2007-05-17. Retrieved 2007-06-24. ^ a b "Hasbro Website Updates Part 2: The Age of Extinction is Nigh! (Listings Updated) - Transformers News". TFW2005. 2013-10-31. Archived from the original on 2013-11-05. Retrieved 2013-12-01. ^ "Grimlock - Transformers". TFW2005. 2008-04-01. Retrieved 2013-12-01. ^ "Key Images From The Transformers Panel at NYCC - Transformers News". TFW2005. 2011-10-15. Retrieved 2013-12-01. Furman, Simon (2004). Transformers: The Ultimate Guide. DK Publishing Inc. pp. 30, 65. ISBN 1-4053-0461-8. This page was last edited on 3 March 2019, at 18:12 (UTC).